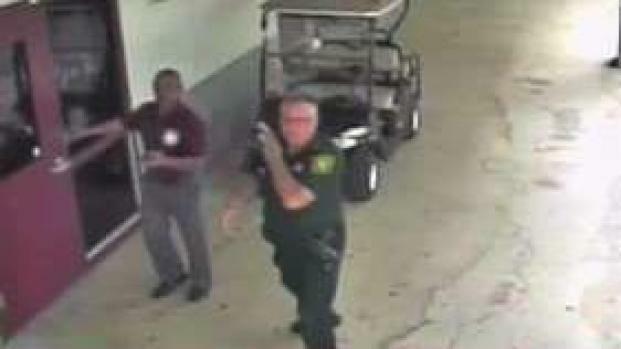 A school resource officer whose actions in the Marjory Stoneman Douglas High School shooting have come under intense scrutiny can be seen in surveillance video released Thursday outside a room in the first moments after the massacre last month. The video shows the moments when school officials and the officer, Broward County Deputy Scot Peterson, first reacted to the gunfire that rang out on Feb. 14. Peterson can be seen with an unidentified school employee walking toward a room at 2:22 p.m., less than a minute after the first shots were fired by accused gunman Nikolas Cruz. Less than a minute later, three people — Peterson, who had radioed in a call of shots being fired, and two others — can be seen on a golf cart driving through campus before taking a position outside the 1200 building where the shooting took place. Officials released surveillance video showing officials' first response at when gunshots rang out at Parkland's Marjory Stoneman Douglas High School. 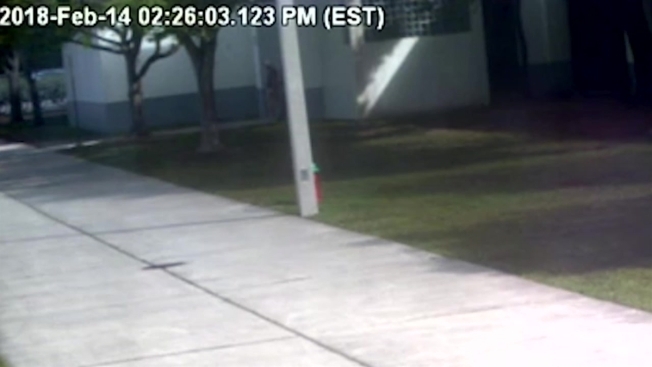 Students, whose images were blurred in the video, can be seen running from their classrooms down an exterior hallway before being told to go in a different direction. Two minutes later, Peterson on radio says “All right... We also heard it’s by, inside the 1200." Cruz exits the 1200 building, leaving AR-15 behind, at 2:27 p.m. The Broward County Sheriff's Office released the video after media outlets, including this station's parent company, NBCUniversal, sued for the right to access that video, saying it was in the public interest regarding the tragic day when former student Nikolas Cruz allegedly shot nearly three dozen students and staff, killing 17. A Broward circuit judge agreed, and BSO and the Broward County school district didn't appeal, paving the way for Thursday’s release. The videos have been a source of interest since investigations began into the actions of several law enforcement officials, including Peterson, who reportedly failed to immediately enter the school building where the shooting took place, as officers are trained to do. Peterson resigned shortly after an investigation was announced, with his attorney claiming he did nothing wrong. No other deputies are seen in the video released Thursday. According to BSO’s Standard Operating Procedure the deputy is trained to enter the building to eliminate the threat. Cruz was arraigned on Wednesday on all 17 counts of first-degree murder and 17 counts of attempted first-degree murder, one week after a grand jury indicted him in the case. Judge Elizabeth Scherer entered a not guilty plea on Cruz’s behalf. Prosecutors in the case said they plan on seeking the death penalty, while Cruz’s public defenders have said he would plead guilty if the death penalty was not an option. The release of the video comes one day after students across South Florida and around the country staged a school walkout to remember those killed and continue the push for gun law reform. Officials this week also released more 911 calls from inside the school during and after the shooting.